Leeds United returned to winning ways as they emphatically ended hosts Bristol City's 12-match unbeaten run. Samuel Saiz's early double put Leeds in control, his first shot deflecting past Frank Fielding before he capitalised on poor defending to make it 2-0. Striker Pierre-Michel Lasogga headed in a third from Kalvin Phillips' second-half corner as the visitors dominated. Both sides were reduced to 10 men late on after Leeds' Gaetano Berardi and the Robins' Matty Taylor clashed. Victory ended Leeds' run of three straight defeats, while Bristol City lost for the first time since 12 August. 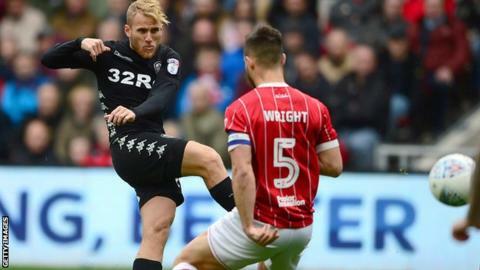 Saiz's seventh and eighth goals in English football came in the opening 15 minutes, as first he collected Lasogga's pass to fire in with the help of a deflection, then, 10 minutes later, Bristol City failed to clear and he drilled the ball home. The Spaniard could have had a hat-trick after the break but he missed the target after Ronaldo Vieira's square ball, while the hosts were also grateful to Aden Flint's block which prevented Lasogga adding to the scoreline. Bristol City head coach Lee Johnson had made five changes, with winger Jamie Paterson unwell and both Korey Smith and centre-back Nathan Back injured, and his side could not find the form that had seen them go 10 league games without defeat. "I have seen the [sending off] incident again and as far as I am concerned Matty was blameless other than to register a complaint over being fouled. "My player has a broken nose so it was a nasty clash. We will definitely appeal the decision and I think the film evidence backs our case. "Overall, it was a bad day at the office for us. We were weak today and that is not usually the case. "We were off it in the first 20 minutes and that's is when the game was decided. Some key players were missing through injury and illness, but those selected were capable of better." "Our thoughts are with Stewy and we wanted to put in a performance for him following the bad news that his mother had passed away. "On behalf of myself, the players and staff, we send our condolences and assure him that this win was for him. "I was very happy with the performance of the team. It is the same players who put us in the position we were in going into the match and today the difference was the intensity of our play. "We knew we were up against a good side and that probably helped. We needed to be brave and believe in ourselves. The early goals were important and today we took our chances." Match ends, Bristol City 0, Leeds United 3. Second Half ends, Bristol City 0, Leeds United 3. Attempt missed. Bailey Wright (Bristol City) header from the centre of the box is high and wide to the right. Assisted by Callum O'Dowda with a cross following a corner. Corner, Bristol City. Conceded by Vurnon Anita. Vurnon Anita (Leeds United) wins a free kick in the defensive half. Offside, Bristol City. Hördur Bjorgvin Magnusson tries a through ball, but Josh Brownhill is caught offside. Foul by Matthew Pennington (Leeds United). Attempt missed. Aden Flint (Bristol City) header from the centre of the box misses to the right. Assisted by Bailey Wright with a cross. Attempt missed. Famara Diedhiou (Bristol City) header from the centre of the box misses to the right. Assisted by Josh Brownhill. Substitution, Leeds United. Jay-Roy Grot replaces Pierre-Michel Lasogga. Ronaldo Vieira (Leeds United) wins a free kick in the defensive half. Bailey Wright (Bristol City) wins a free kick in the attacking half. Attempt saved. Marlon Pack (Bristol City) right footed shot from outside the box is saved in the top right corner. Assisted by Bailey Wright. Substitution, Leeds United. Vurnon Anita replaces Samuel Sáiz. Bobby Reid (Bristol City) is shown the yellow card. Corner, Bristol City. Conceded by Kalvin Phillips. Matty Taylor (Bristol City) is shown the red card for violent conduct. Gaetano Berardi (Leeds United) is shown the red card for violent conduct. Delay in match Matty Taylor (Bristol City) because of an injury. Delay in match Ronaldo Vieira (Leeds United) because of an injury. Attempt blocked. Marlon Pack (Bristol City) right footed shot from outside the box is blocked. Assisted by Joe Bryan. Substitution, Leeds United. Hadi Sacko replaces Ezgjan Alioski. Substitution, Bristol City. Hördur Bjorgvin Magnusson replaces Jens Hegeler. Goal! Bristol City 0, Leeds United 3. Pierre-Michel Lasogga (Leeds United) header from the left side of the six yard box to the high centre of the goal. Assisted by Kalvin Phillips with a cross following a corner.